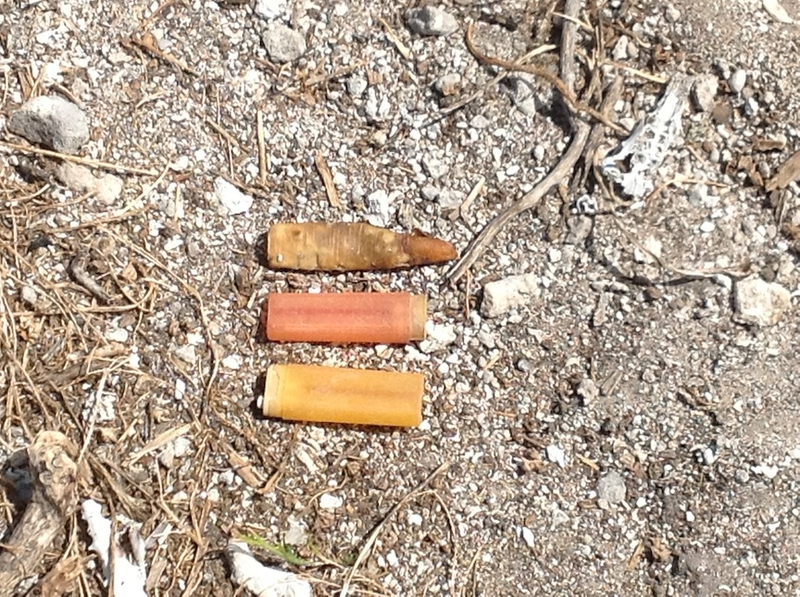 This entry was posted in Beached Birds, Marine Debris on 27. December 2017 by coasst. Common Murres (Uria aalge) are one of the most fascinating marine birds in the North Pacific. As adults, these “footballs with wings” can fly as easily under the water as they can on land. 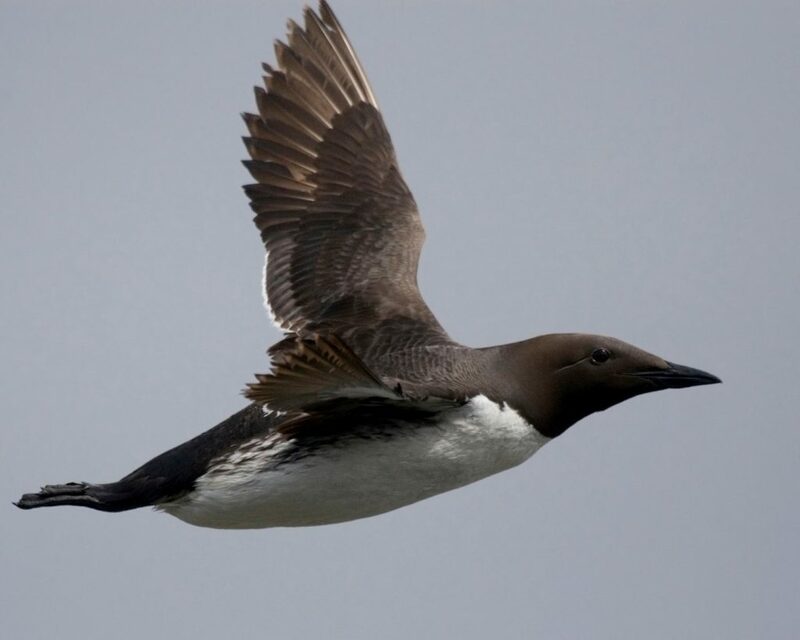 Murres have been found diving as deep as the continental shelf (~200m), zooming around after forage fish and krill. Especially during the breeding season, it takes two parents fishing for most of each day to sate the demands of their single hungry chick. One of the reasons is because parents bring back one fish at a time, and always head in, tail out. 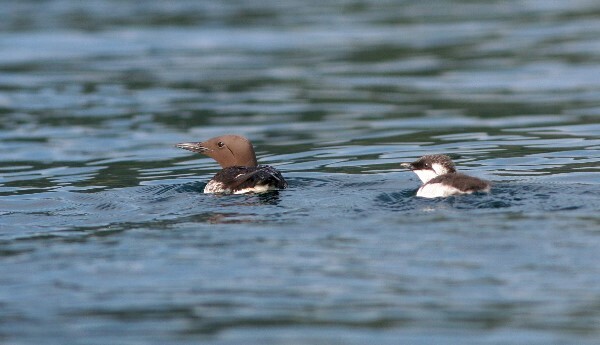 Fortunately for the parents, young murres leave the colony after a scant three weeks. Early in the evening, as the sun tips below the horizon, a murre chick will leave the safety of the colony and walk to the edge of the cliff, accompanied by the male parent. Dad and chick often engage in an extended conversation – it’s impossible to watch and not pretend that Dad is giving his chick a last few bits of advice. Well heeded! 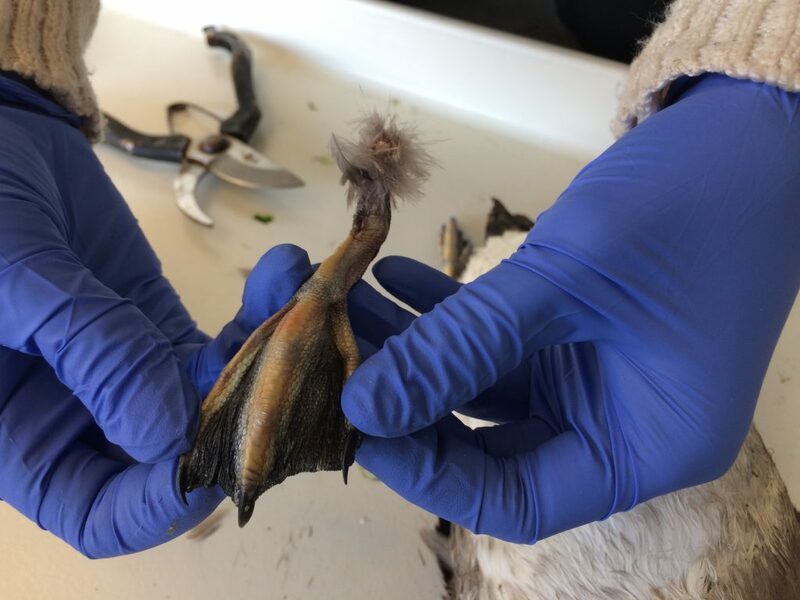 A murre chick actually fledges before its wings have grown flight feathers. Essentially a fuzzy tennis ball with winglets, these chicks take a leap into the unknown. Will they hit the water, or the rocks below? Turns out that it doesn’t matter. Although you might think this is a “dinosaur waiting to happen” survival strategy, the worst imaginable (a splat) doesn’t happen. Instead, young murres bounce on the rocks, pick themselves up and run for the waves, avoiding marauding gull predators on the way. Once safe on the water, each chick begins calling loudly: Cheep! Cheep! Cheep! 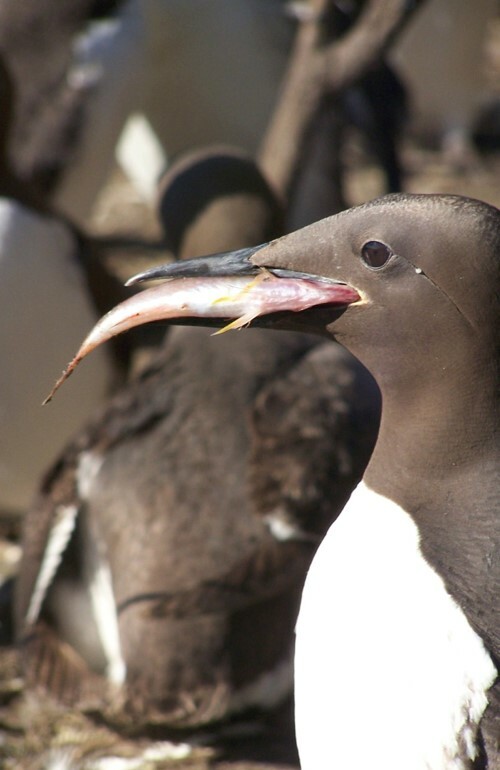 If you’re within sight of a murre colony, it’s a sound you can hear from the mainland during the fledging season (July in California and Oregon; August/September in Washington, British Columbia and Alaska). And it’s a good thing fledglings have a loud voice because they’re announcing their presence to Dad, who returns the call with a guttural: Eh! Eh! Eh! Eh! Eh! They will spend the next several weeks together, until the fledgling learns to fish. Of course this is an especially dangerous time: pairs can get separated and storms can make fishing difficult. COASSTers know that the post-breeding period is the time to expect murres to wash up on the beaches. 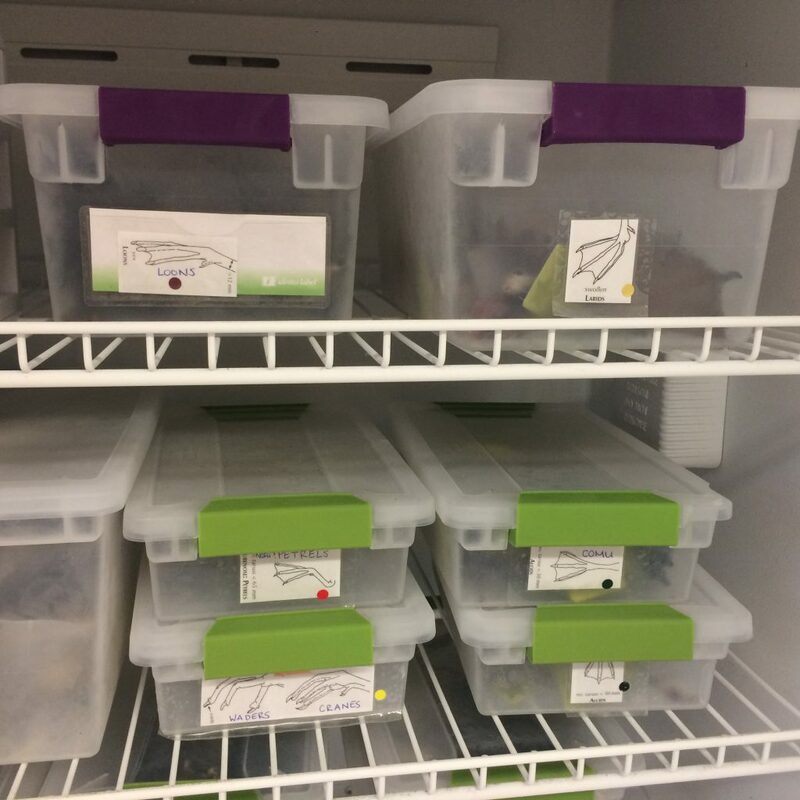 And this got us wondering, is there a signal in the beached bird data that might tell us something about how successful breeding was on the colonies? Where and when, on average, we expect to see adult and juvenile common murres on COASST beaches. 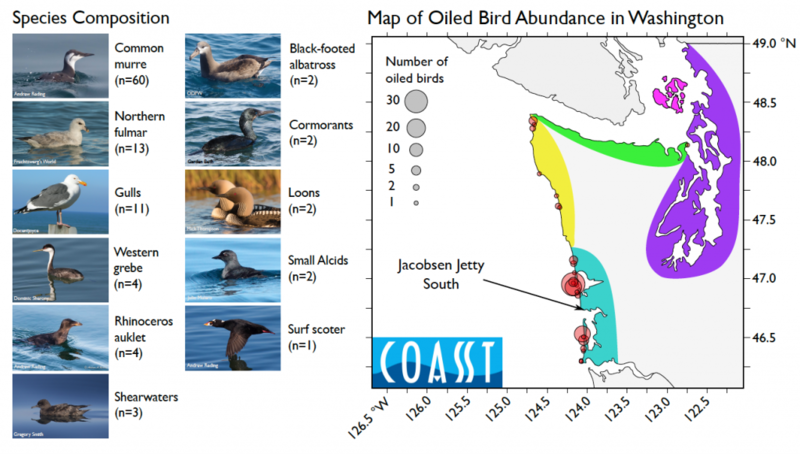 To figure that out, we turned to Rob Suryan, Associate Professor at Oregon State University, who maintains a long-term database on the Common Murre colony at Yaquina Head Outstanding Natural Area, immediately north of Newport, Oregon. Rob and his team spend the early summer in the Yaquina lighthouse surveying the murre colony and counting the eggs, then chicks, then fledglings. This gives them a measure of the breeding success of each pair: the average number of fledglings per pair. Given that murres only raise a single chick, the very highest this number could ever get is 1.0 (if every single pair was successful). In reality, something above 0.70 signifies a good year. In poor years, numbers below 0.40 are common. We reasoned that in a really good year, colonies would produce a lot of fledglings, filling the nearshore with Dad-chick pairs. 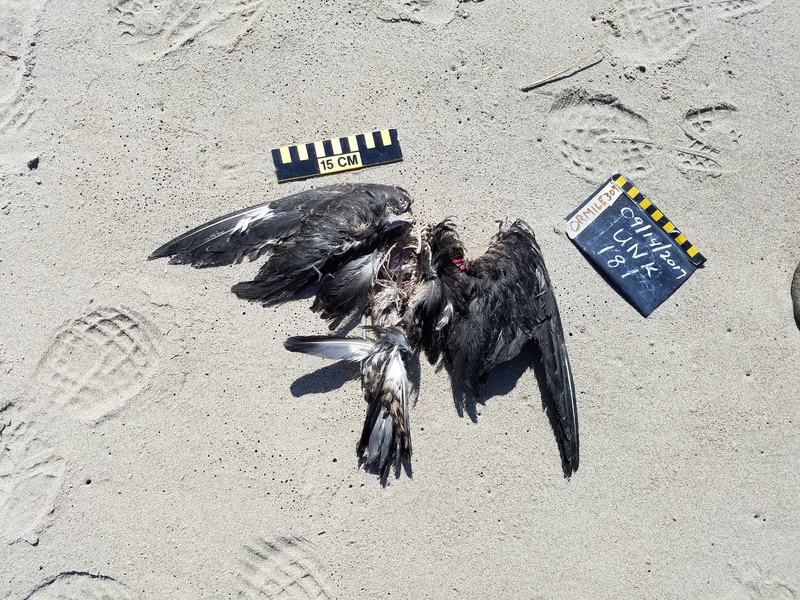 And COASSTers might see that signal on the beach as more than the usual number of juvenile murres, because juvenile mortality is always higher than adult mortality. By contrast, in poorer years, fewer chicks would even reach fledging stage, and adults would likely be stressed and thinner, more susceptible to the ravages of early fall storms. In these conditions, COASSTers might see relatively more adults. That is, both relatively more than juveniles, and absolutely higher encounter rates than “normal” years. Turns out, we’re right! 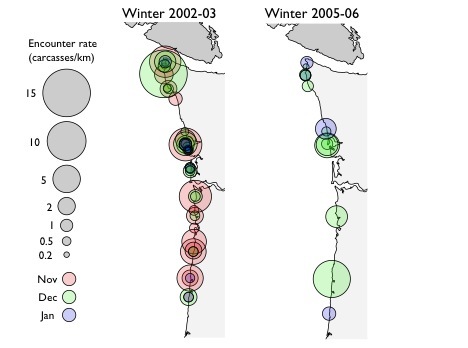 The graphs below show the relationship between breeding success on the Yaquina Head colony (on the horizontal, or X axis), and measures of COASST data (on the vertical, or Y axis). Each point is a different year, colored so you can easily find each one. 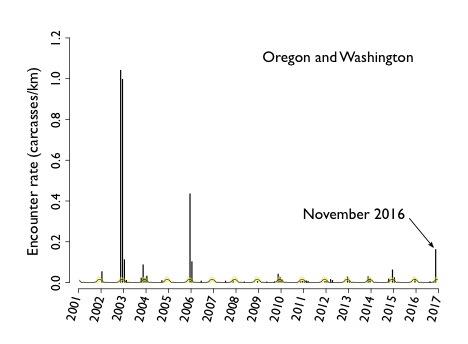 Left: the relationship between how many adult murres are found per kilometer of beach surveyed over the August-September post-breeding season in Northern Oregon. 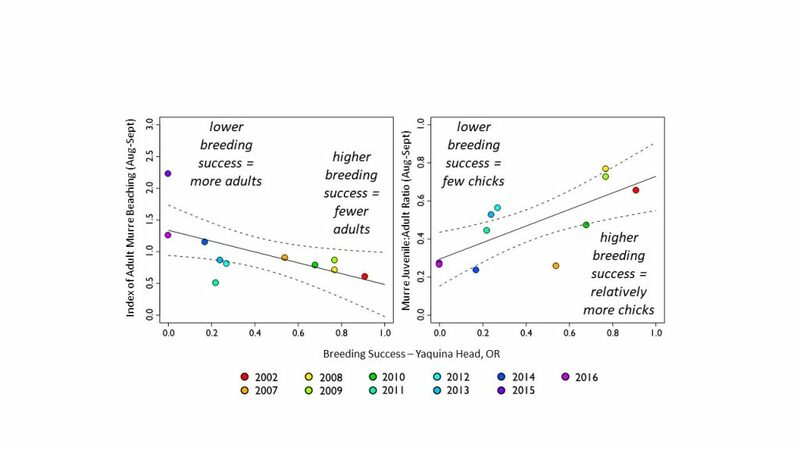 The solid line shows that there are more carcasses when breeding success is truly poor, fewer when breeding conditions are good. Prediction confirmed! 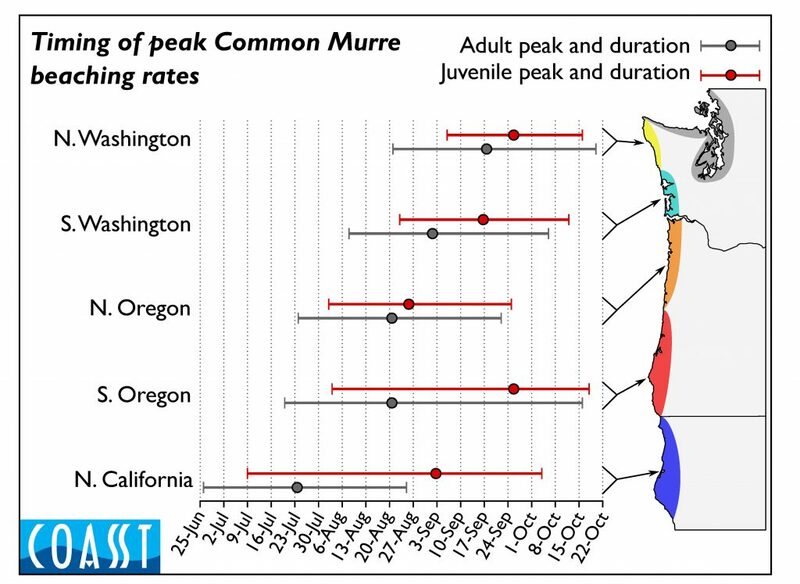 Right: the relationship between the proportion of all murres found that are juveniles (for math geeks: juveniles/(adults + juveniles)) and breeding success. Again, our prediction – that good years would yield higher numbers of juveniles – is confirmed! What does all of this mean? Basically, that beached bird data can stand in as a proxy for breeding success on the colony. 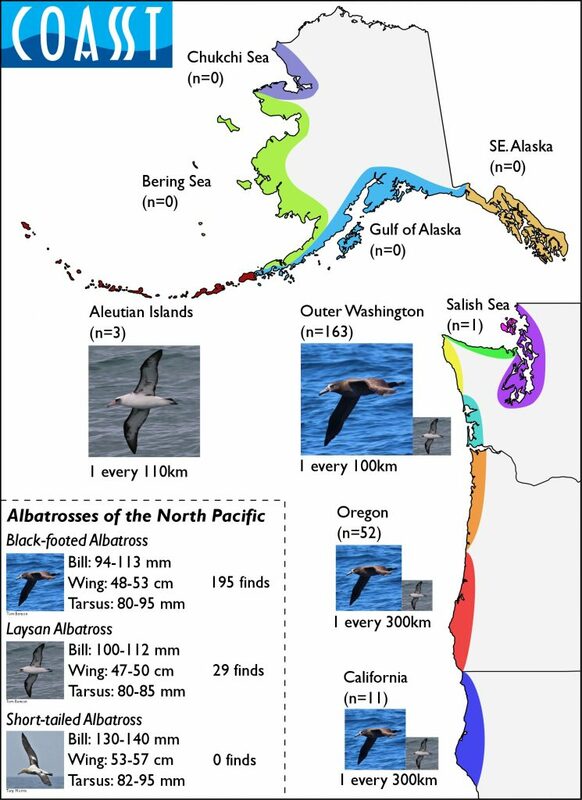 And this is really good news, because most of the murre colonies in the Pacific Northwest are not regularly monitored, either because they are too far from shore to see (like the Yaquina colony), or because the island or spire where the murres nest is literally unscalable. 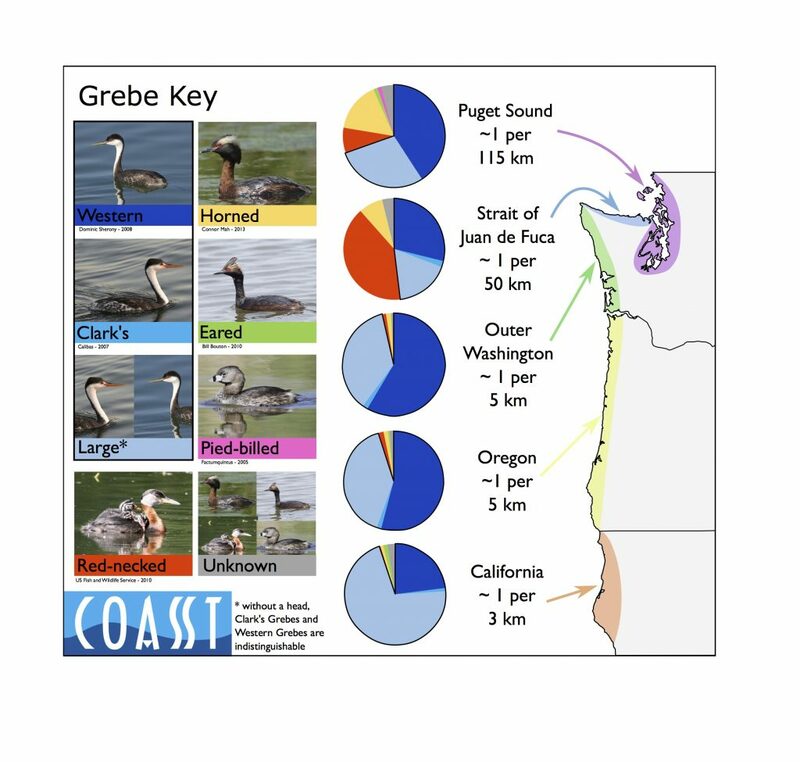 If you’re a Pacific Northwest outer coast COASSTer, take special care on your late summer and fall surveys – your murre data are showing us that death is part of the life of the ecosystem. 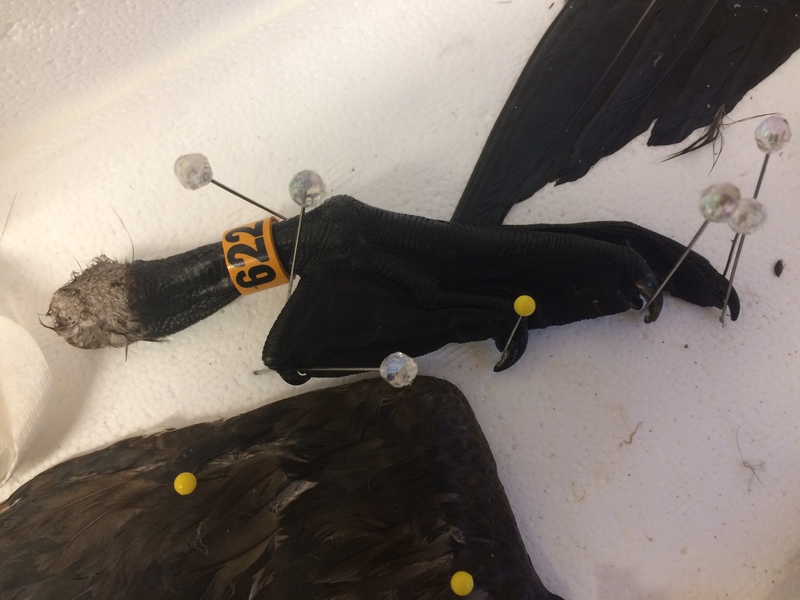 This entry was posted in Beached Birds and tagged common murres on 28. September 2017 by coasst. All quiet on the western front? Lower 48 Outer COASSTers, and our data verifier Charlie Wright, have – after breathing a huge sigh of relief! – been reporting that it’s been a little too quiet this winter. 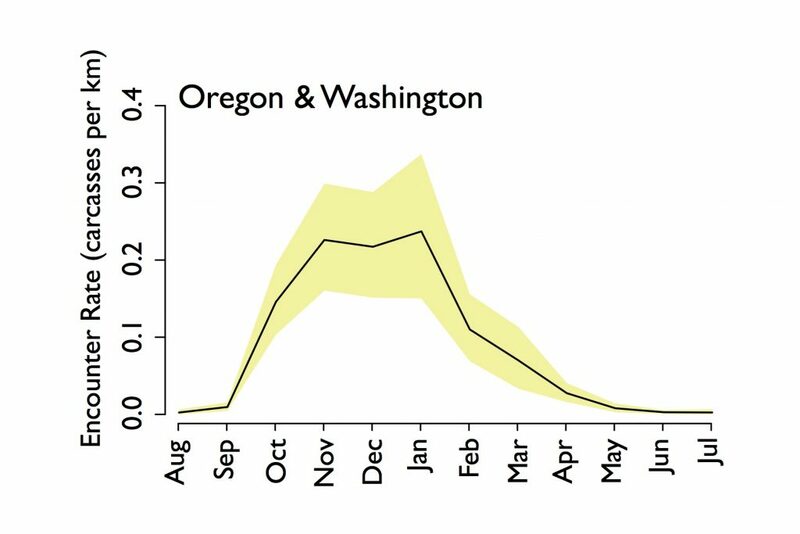 In fact, COASST surveys from November 2016 to February 2017 from Washington down to California recorded the lowest encounter rates of beached birds we’ve seen since we started! 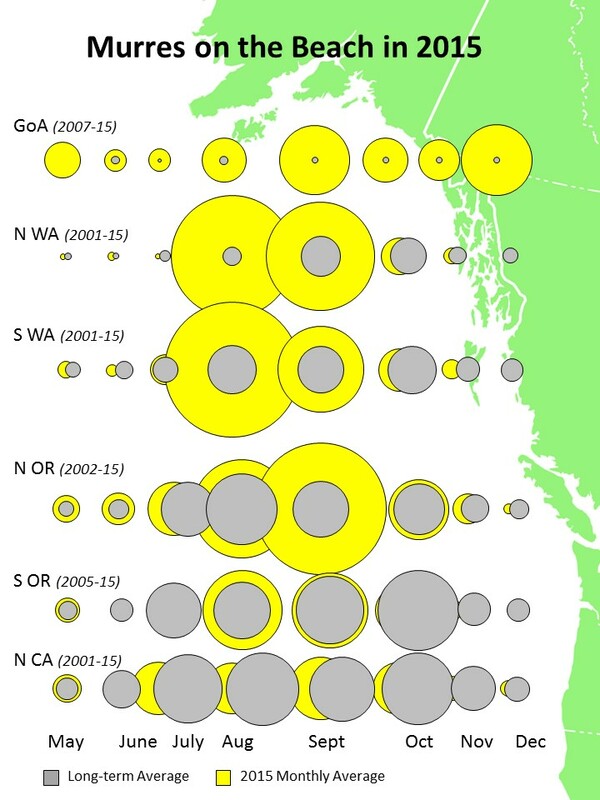 The “heartbeat” graphs below show the long-term (starting in 2001 for WA and OR; 2006 for CA) baseline (solid black line) and a measure of variability around it (yellow wash). The gray bars are the average monthly values for that region of the coastline. We’ve rolled up the COASST data by state, so realize that there are a lot of beaches represented by each bar. In this graphic, it’s easy to see the recent mass mortality events – these are the gray bars that are way over the baseline (and just a note for the statistically geeky – COASST deletes all of the mass mortality event months, which we define as more than 4 times the baseline, from the baseline calculation). But check out what’s been happening most recently. We’ve expanded the last four months and displayed them as a percent of the baseline. Only December in Washington and February in California reach ~100%. All other region-month combinations are at less than half of the number of birds we would expect over the same period. Of course, compared to the death and destruction of recent winters along the outer coast, too few birds doesn’t ring alarm bells. But we have been wondering, who is missing? The red bars are what is happening this winter, from Nov-Dec 2016 in the top panel, to Jan-Feb 2017 in the bottom panel. 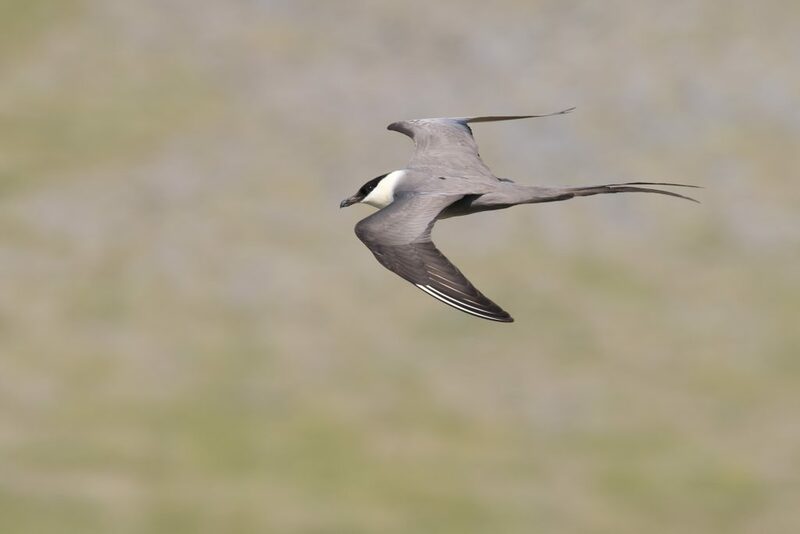 With some exceptions (check out Northern Fulmars, phalaropes in November-December and kittiwakes in January-February), most groups are drifting in at lower rates. We’ve boxed “top 5” contributors that have dropped this year by more than half. 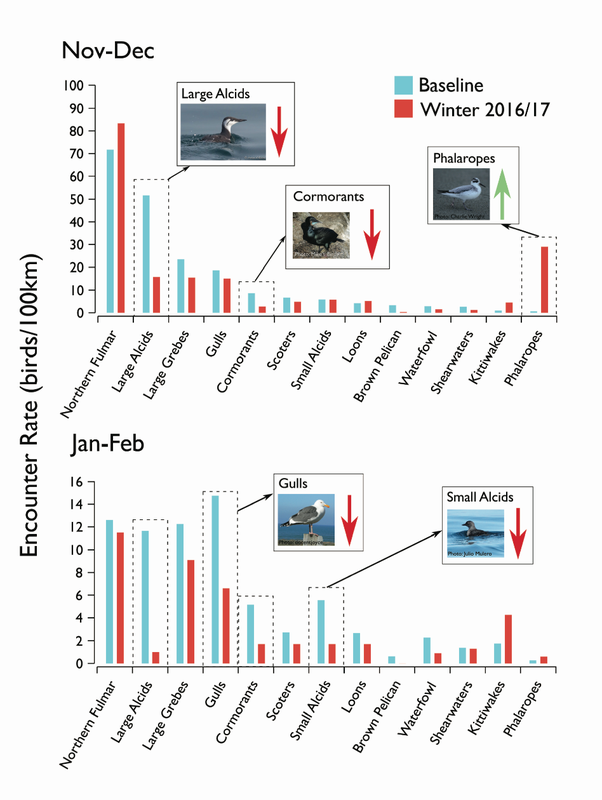 Large Alcids – mainly murres – were much less abundant than usual, with rates ten times below normal for January-February. 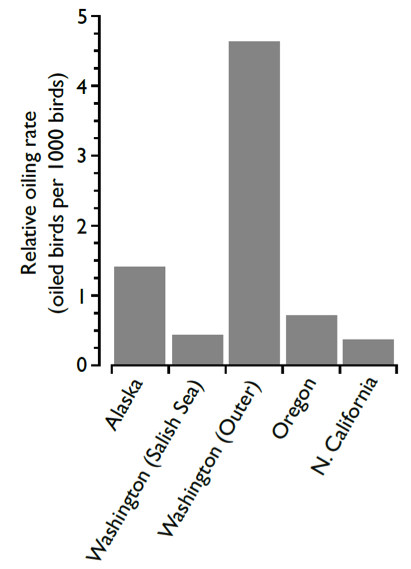 Rates for gulls, cormorants and small Alcids (primarily Cassin’s Auklets) were also much lower than normal. 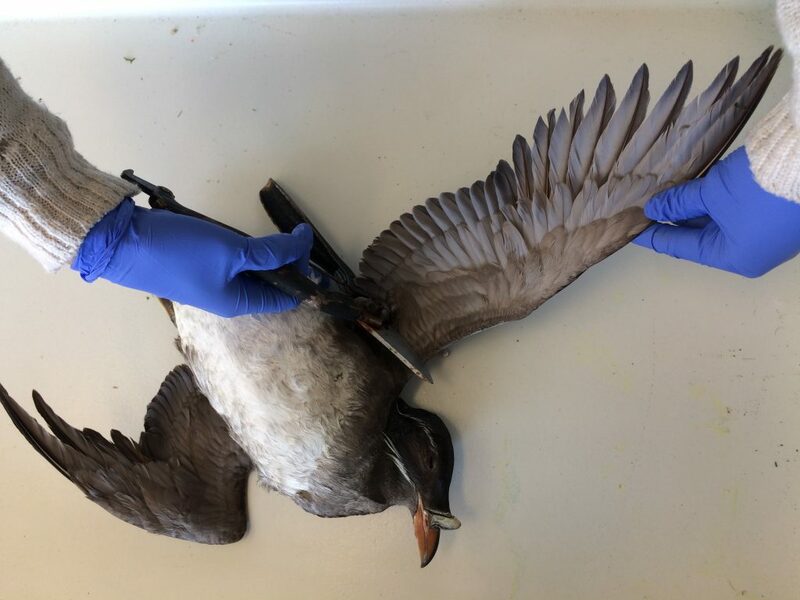 Both large and small Alcids have been having a rough time recently, with significant mortality events effecting Cassin’s Auklets in the winter of 2014-15, Common Murres in the winter of 2015-16 and Rhinoceros Auklets in the summer/fall of 2016. In fact, this is the first winter in three years that lower 48 outer coast COASSTers haven’t responded to a major die-off event. Where post-breeding birds disperse to is an important factor in determining whether and how many will end up on shore. 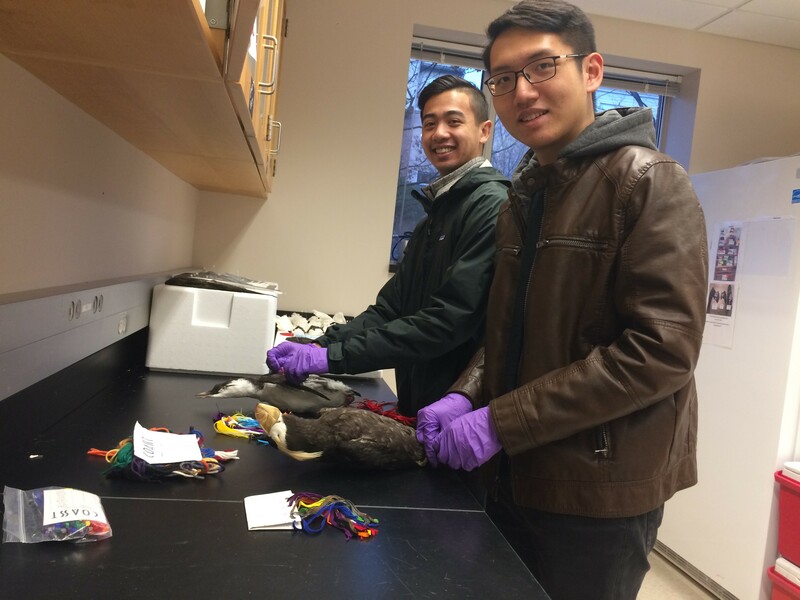 Should they die in a winter storm, birds that have taken up their wintering residence far offshore have little chance of floating to the beach before they sink or are scavenged at-sea. 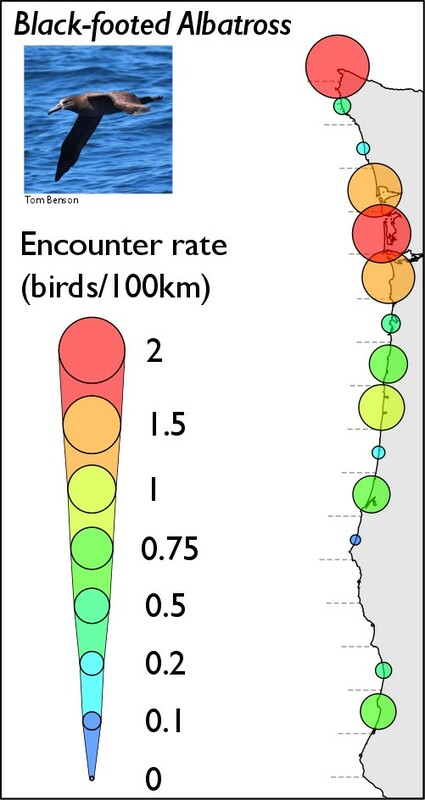 This is usually the case with Cassin’s Auklets, as geolocation tagged birds have ranged throughout the eastern half of the North Pacific in winter. Undoubtedly, some of the birds are simply way out there. But the simplest explanation is that fewer birds are dying. Across the board declines in the rate at which COASSTers are encountering carcasses is usually indicative of milder conditions, and/or plentiful food. The winter storm conditions were fairly average compared to the long-term average, and with ocean temperatures approaching near-normal levels off of the whole of the west coast by late 2016, conditions may finally be returning to some level of normalcy. Should we be worried about the lack of dead birds on beaches? With the tumultuous last several years, COASST has come to expect a “new normal.” Whether that now includes a return to the “wreck years” is an open question. In the meantime, COASSTers should relax into their next survey and enjoy the respite! This entry was posted in Beached Birds on 17. March 2017 by coasst. 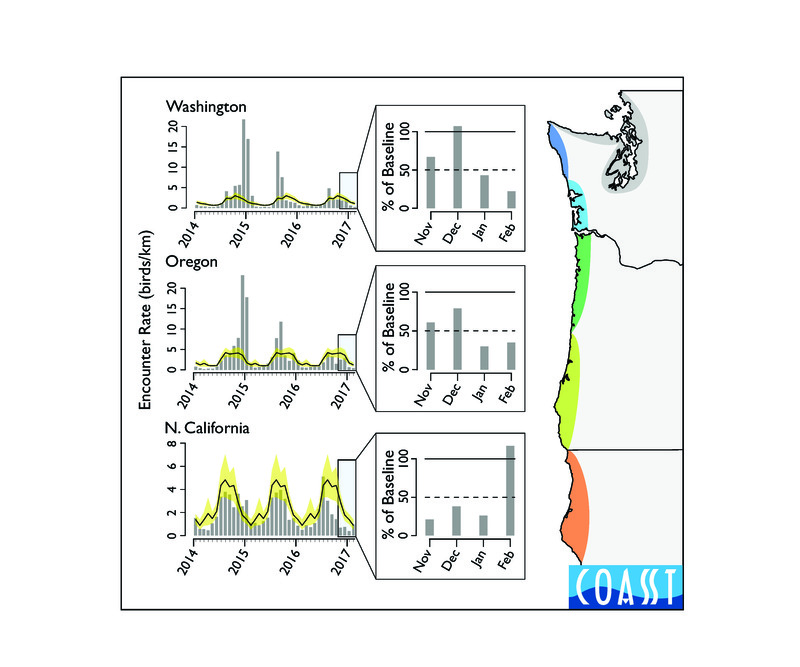 COASST data show that the annual murre post-breeding mortality signal (August-September) was observed in Alaska and the lower 48 in 2015, and was particularly accentuated along the outer coast of Washington and the northern coast of Oregon. 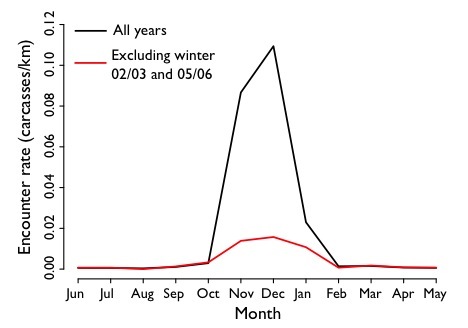 Elevated murre mortality levels occurred both before and after the breeding season, creating a continuous signal stretching from May through to present (December). 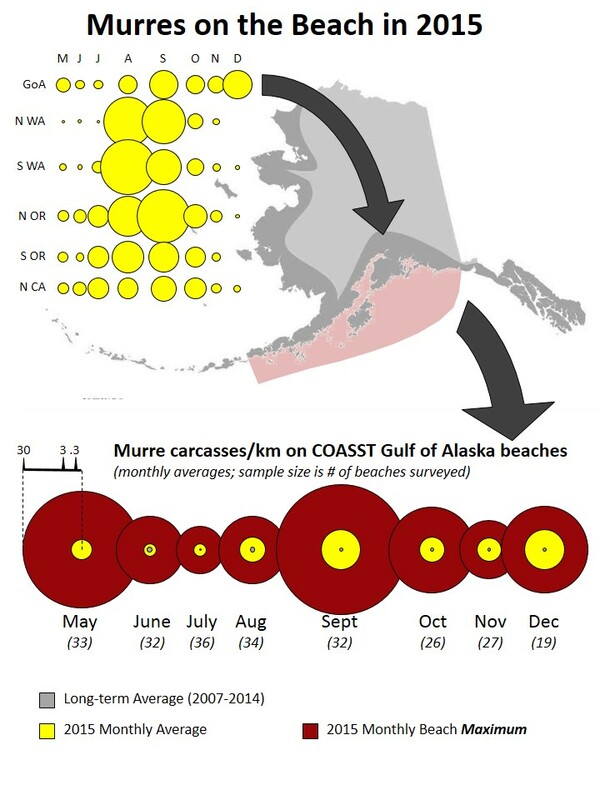 Maximum COASST beach counts (red circles) are significantly higher than the 2015 monthly averages (yellow circles), and maximum anecdotal reported counts are 1-2 orders of magnitude above that. Many thanks to our intrepid, dedicated participants who are braving long days on rugged beaches to document the extent and magnitude of this mortality event! 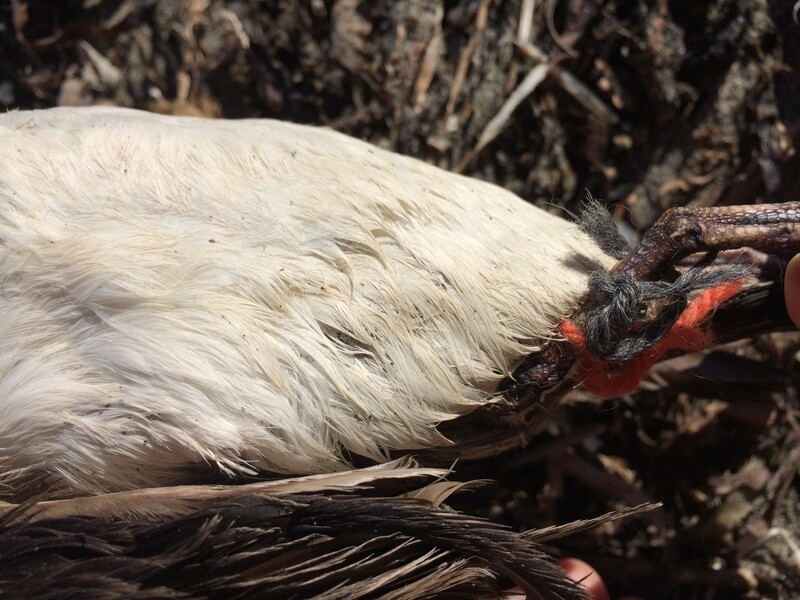 This entry was posted in Beached Birds, Uncategorized and tagged common murres, wrecks on 7. 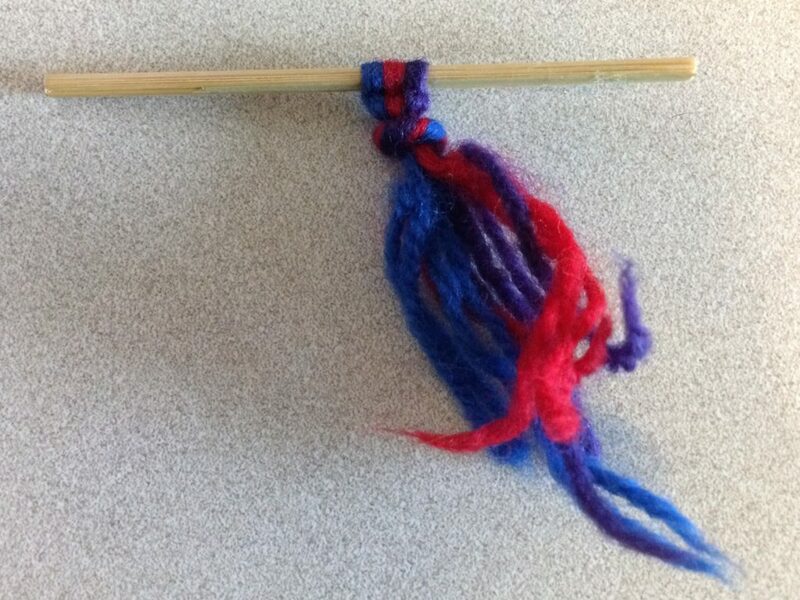 January 2016 by coasst.